Welcome to Unified Sampling. Use Unified Sampling to optimize ( DoF-, Motionblur-, Reflection-, Refraction-, Area Light + IBL Shadow-Samples) your Rendering Speed + Quality. Introduce a new sampling mechanism that unifies the different sampling controls of the ray tracing, rasterizer, and progressive rendering engines. It offers direct control of sampling quality coupled with perceptual adaptivity to detail in the image. It is disabled by default, and gets enabled and controlled with string options. 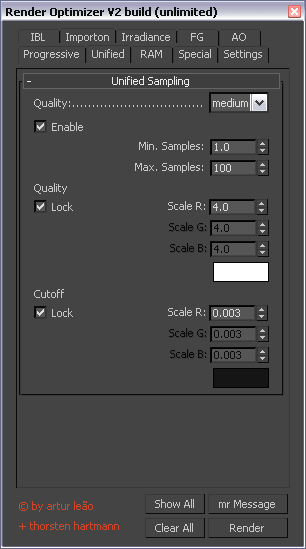 The existing sampling controls are kept for backwards compatibility and work as in previous versions of mental ray when the feature is not turned on. at the next Blog Dynamic Filtering . . .